As a small-to-midsize fabricated metals manufacturer serving large customers within complex global supply chains, how do you maintain preferred vendor status? The whole world is your competition so you need to step up to meet increasingly demanding customer expectations. Your customers will expect mass personalization with shorter lead times whether the order is large or small—without sacrificing compliance with their industry’s quality requirements. 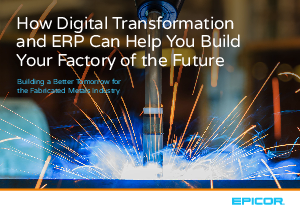 To meet these demands—despite a skills shortage and volatile material costs and availability—you’ve got to put digital transformation at the top of your agenda.